To a beginning student, the relationship be­tween a simple wave on a string and the complicated interactions of optics can be hard to grasp. PASCO’s answer is microwave optics. There are advantages to studying optical phenomena at microwave frequencies. Using a 3-cm microwave wavelength radically changes the scale of the experiment. Microns become centimeters and variables obscured by the small scale of traditional optics experiments are easily seen and manipulated. PASCO’s Microwave Optics System takes full advantage of these large-scale benefits. The large wavelength makes it easy to understand and visualize electromagnetic wave interactions. Interference and diffraction slits are several centimeters wide, and polarizers are slotted sheets of Stainless Steel. Most traditional optics experiments can be performed with this Microwave Optics System: from determining the laws of reflection and refraction to investigating polarization effects to examining the phenomena of diffraction and double-slit interference. Basic wave experiments can also be performed. Students can investigate standing waves be­tween two reflectors, locating nodes and antinodes. Com­bining these experiments can establish a clear parallel between electromagnetic wave interactions and mechanical wave theory. With Teacher’s Guide and Sample Data. Diffraction Slit Hardware — Spacers and holders for performing interference experiments. Ethafoam® Prism with Styrene Pellets — Used for refraction of microwaves. The index of refraction of styrene is determined. Rotating Mounts — The transmitter and receiver rotate through a full 360° (an important feature for polarization experiments). Gunn Diode Transmitter — A stable, low-voltage source of linearly polarized microwaves (10.5 GHz; 15 mW). 18 cm High Mounts — Minimize tabletop reflections for improved accuracy. Receiver with a Built-in Amplifier — Variable sensitivity ensures clear data, even for low-intensity measurements (Bragg diffraction and Brewster’s angle). Long-Arm Goniometer — For easy setup and alignment. The built-in degree and millimeter scales ensure accurate measurements. 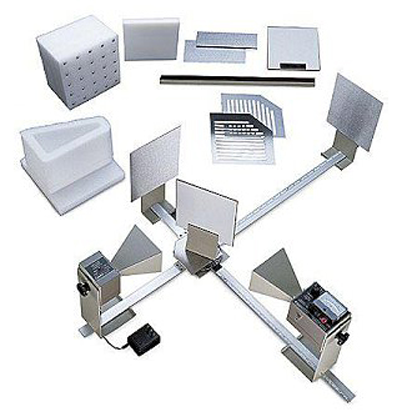 Magnetic Mounting — All components mount magnetically. Setup is quick and accurate. Durable Construction — Parts are made of stainless steel or die-cast aluminum.